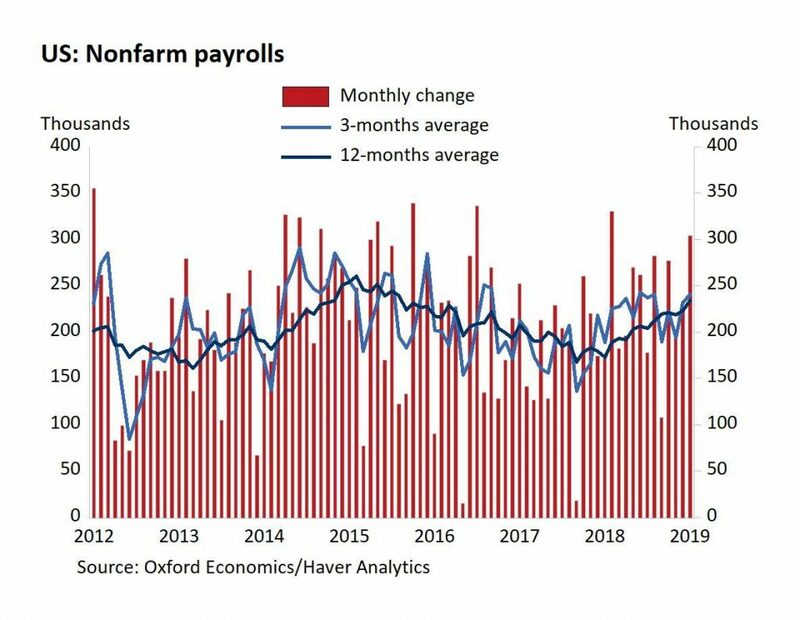 As you can see from the chart below, the latest results have led the 3 month and 12 month average job creation to increase. The 12 month average is near the peak in early 2015. Bad news is the labor market is a lagging indicator. So using a moving average is going to give us even more delayed data. Since we still don’t have a few economic reports because of the government shutdown, lagging data tells us more than it usually does. 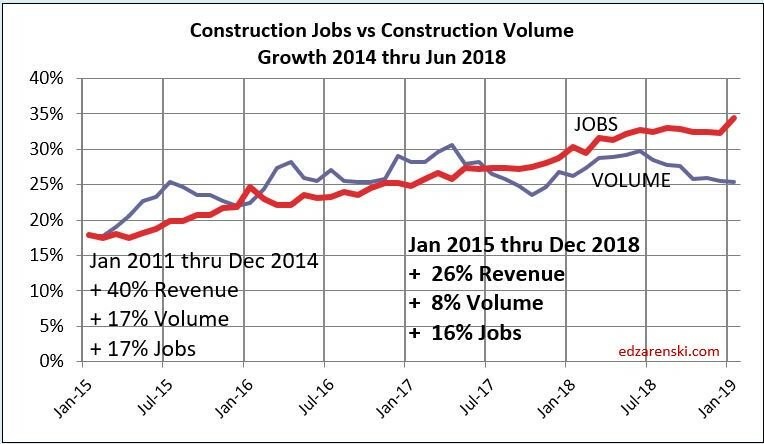 The chart below shows the recent gains in construction jobs, versus volumes, and revenue. From 2011 to 2014, revenues were up 40%, volumes were up 17%, and jobs were up 17%. In the past 3 years, revenue was up 26%, volumes were up 8%, and jobs were up 16%. Even though revenue and volume growth fell sharply, job growth was still almost the same. That’s probably because construction was starting from a low level in 2011. Revenue growth is much higher in relation to volume growth probably because prices have increased quicker. The most concerning aspect is in the past 6 months where job creation was up and volumes fell. This is unsustainable. I wouldn’t be surprised if job growth in the construction industry falls in the next few months. Retail trade added 21,000 jobs. There have been barely any jobs added in the past 12 months. Sporting goods, hobby, book, and music stores added 17,000 jobs which counters the declines in the past 2 months. It’s interesting to see job creation in January instead of December. That’s because of the seasonal adjustment. General merchandise stores hemorrhaged 12,000 jobs. This was better than the 28,000 job loss in the previous month. 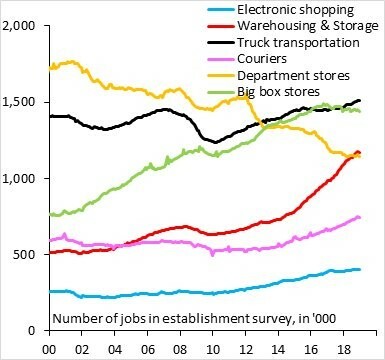 The chart below shows the number of jobs created in various retail categories since 2000. It’s not that physical retail is dying; it’s that the sector is dramatically transforming. If firms don’t innovate, they will be destroyed by online stores. As you can see, department stores have been in steady decline for the past 19 years. Warehousing and storage jobs have been boosted by online stores, principally Amazon. Big box stores have been stagnant in the past few years. This is different from the stagnation caused by the last recession. Consumers are now growing their spending. 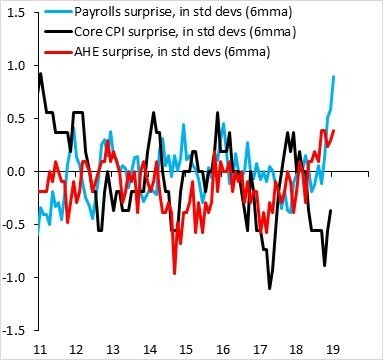 The chart below shows the standard deviation of the historical beat rate of the 6 month moving average of payrolls, core CPI, and average hourly earnings. It’s not a guarantee that the standard deviations will regress, but you would think economists would adjust their forecasts after being so wrong. Plus, extreme levels in these metrics can be unsustainable. For example, the payrolls can’t sustain at above a 300,000 rate because the labor market is getting closer to full employment. It would be a double whammy if expectations get above 200,000 for February. I don’t think the potential trend of big beats and negative revisions will continue. Every sample is different. If there was a flaw in the calculation that caused this, it would be fixed. Average hourly earnings growth is different in the sense that wage growth should accelerate in a nearly tight labor market. However, the expectations can adjust. Core CPI growth has been stymied by shelter inflation recently. The unemployment rate increased from 3.9% to 4% because people came off the sidelines and back into the labor market and because of the government shutdown. The government shutdown caused the U6 unemployment rate to soar because many furloughed workers took part time jobs. The rate was up from 7.6% to 8.1%. That’s the highest since February 2018. The great news is the labor force participation rate increased from 63.1% to 63.2% which is the highest since September 2013. The prime age labor force participation rate increased from 82.3% to 82.6%. That’s the highest rate since April 2010. The rate peaked at 83.4% in the last cycle and 84.6% in the 1990s cycle. January 2019 Jobs Report - At the recent rate this percentage has been spiking, the labor market can achieve full employment this year. 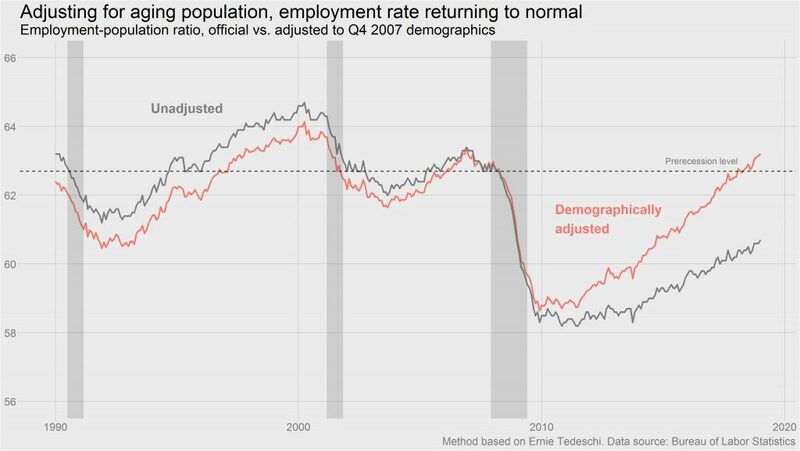 As you can see from the chart below, the demographically adjusted unemployment rate is very close to the last cycle peak and nearing the 1990s cycle peak. This cycle has been elongated partially because the consumer has deleveraged, and the banks didn’t take insane risk like last cycle and partially because the labor market started with a high amount of slack. Now that the slack is about to run out in the next 1-2 years, investors need to recognize that a recession doesn’t immediately occur after full employment is reached. The Fed needs to raise rates too high and inflation needs to accelerate. As of February 2019, neither of those recession catalysts are in place.